Many of you are probably aware that I was out of the office in October 2014 for a week. 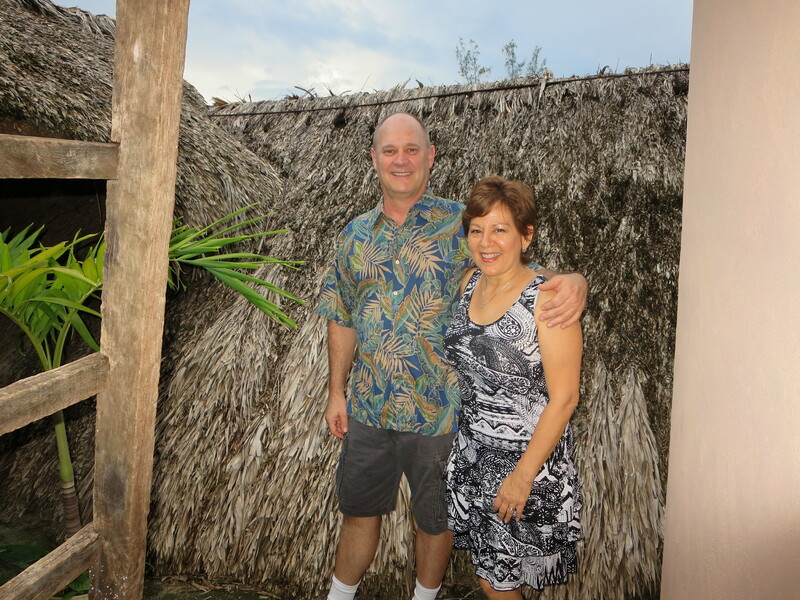 My husband Robert and I had the pleasure of taking a missionary trip to visit friends in a village called Senór, located three hours south of Cancun, Mexico. It’s been 7 years since we last shared our ministering gifts with the native Mayans there. Our friends (who are the pastors of our church) have had a relationship with them for over 30 years, from back when they lived in Mexico near this village. For this reason, there is a long-term relationship between our friends in Senór, Quintana Roo, Mexico and our church. After our flight there, we rented a van and drove the three hours to Senór on mostly nice roads, passing many all-inclusive vacation resorts on the way. Upon arrival, we were greeted with hospitality and excitement. The Mayans are not all impoverished people; their needs are met and now many of the villagers work for the resorts so there is some money to be spent. Not to make this political, but it’s another region affected by the almighty dollar. The roads in Senór are hard-packed dirt and most of the villagers walk or take the “MotoTaxi,” which is like a golf cart with a back seat and a motor. I forgot how hot and humid it is there for most of the year. We found reasons to be in the van just to soak up a little A/C! We would gladly drive the 20+ minutes to the town square, Felipe Carillo Puerto. It’s the only A/C we enjoyed until we went into the grocery stores and the equivalent of Wal-Mart for our shopping pleasure. We brought along our hammocks to sleep in (that the Mayans made for us many years ago.) We got to take a siesta every afternoon, when it was too hot to think of doing much else. The first part of our Mayan friends’ day is spent busily preparing food. 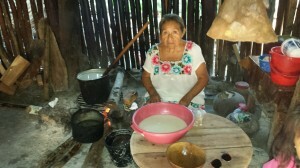 Most of the women spend hours making tortillas on a griddle over an open flame in their outside kitchens. One of the more interesting meals is cooked in the ground. A big pit is dug and filled with heated stones. They then lower large pots of food into the hole and cover the whole thing with palm branches and sheets of metal and wood, and let it cook all day. It was delicious! After lunch, there’s the siesta time and in the later afternoon is when all the excitement begins. We had meetings every night. Robert preached in the village we stayed in and the other two villages we went to. We laid our hands on and prayed for everyone who wanted prayer. We had an interpreter who either interpreted into Spanish or Mayan. The first 2 years I went, I took along a compact folding table to work on. The next few times we used an old dining table with a piece of foam on it. This time I was speechless when a massage table showed up. In the middle of the Yucatan jungle, a massage table appeared for me to use for patients! On Thursday night at church, the announcement was made and on Friday morning about 10:00 AM, patients started coming for treatment. I always feel so blessed and touched that they trust me and let me help them. Just like you, they responded well to chiropractic care. I check their spine the same way I check yours. Interestingly, the spinal findings were similar but overall fewer areas were involved, maybe because their lifestyle has a variety of physically demanding activities. The women hang their clothes to dry on a line. The men make their own blocks for building walls; they carry logs and palm branches for building a roof. Their lives are quite different than our sedentary ones. There is electricity in every house, hut and palapa, but there is something about the electrical standards that discouraged me from bringing my high-powered Impulse iQ chiropractic adjusting instrument along on the trip. 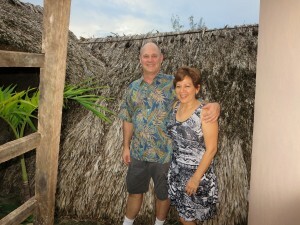 By the way, a palapa is an open-sided dwelling with a thatched roof made of dried palm leaves. Life is very different there, yet we feel such camaraderie with our Mayan friends. I am looking forward to going again in the coming years. To view a gallery of photographs from this trip, click here.